Perhaps oldschool thrashing/death metal hybrids are making a comeback of late, as it seems like I've seen quite a number of albums pop up with this type of sound. Such an album is Dreadful Life, the debut LP of Finnish newcomers Skeletal. Their sound isn't incredibly innovative; as they clearly state, the songs are inspired by the classic death and thrash metal period of the late 80s and early 90s. But that's not the worst thing to be inspired by, and their chaotic and aggressive delivery of their material make the album strong in its own right rather than just a clone of its influences. Plus, it's not all just thrashing and blastbeats. There is a cold melodic influence at work that I attribute to their Finnish origins, and it sure sounds good. A lot of their songs have a Master flavor, or perhaps early Massacre, including Sewers of this World (one of my favorites here), but few Master tracks were as melodic or solo-driven as these ones are. The crossover-thrash vibe of Downward Spiral is also particularly welcome, featuring tight blastbeats paired with the sullenly rattling lo-fi riffs of lead guitarist Make, flying up into harmonic squeals at times. Though speed is where the album has its best moments, there are a couple of songs done in a crushing, doomy style, and Ravaged, in the middle of what seems like it would be a three-minute blastfest, stops for a surprisingly introspective bridge, moving to clean and bass-driven melodies unexpectedly. Too bad the album's so short, though; it's only half an hour long, and there are also a few small weaknesses in the songs, particularly Return to the Grave, which has a more sorrowful, blackened sound to it but also seems to be an incongrous fit with the rest of the tracks. But that's mere nit-picking. 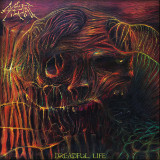 As a tribute to the classic era of death metal, Dreadful Life does well, but even considering the template laid out by its predecessors, this is a thoughtful and particularly well-made album.